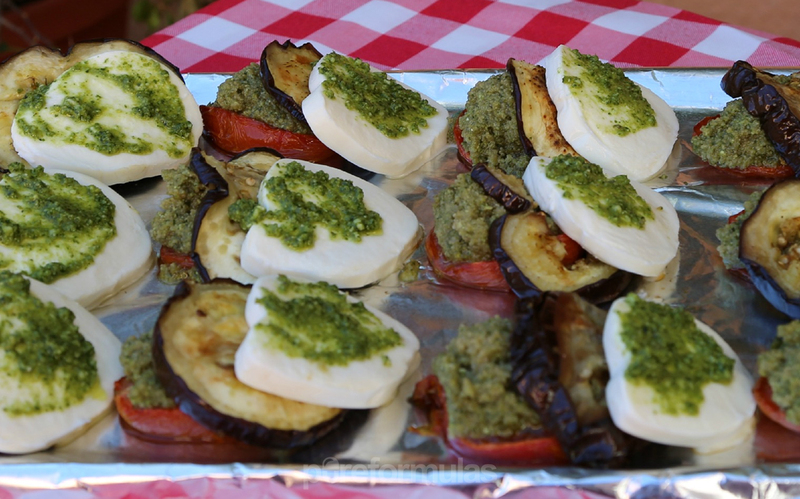 You might have seen this ancient grain in baked goods, but mixing amaranth with pesto to make this delightful eggplant stack is just perfection! Although this recipe is quick and painless to make, the key is just making sure that you don’t slice the eggplant too thinly, at least 1/2 inch (this is about the width of your thumb). Since the eggplant loses water when it bakes, if the slices are too thin, they will become very difficult to remove from baking sheet in one piece. This is another dish that works very well to serve together with your favorite mixed greens! Not only will it make you look like a top chef due to it’s sophisticated presentation, but it will impress the taste buds of your friends and family that try it. 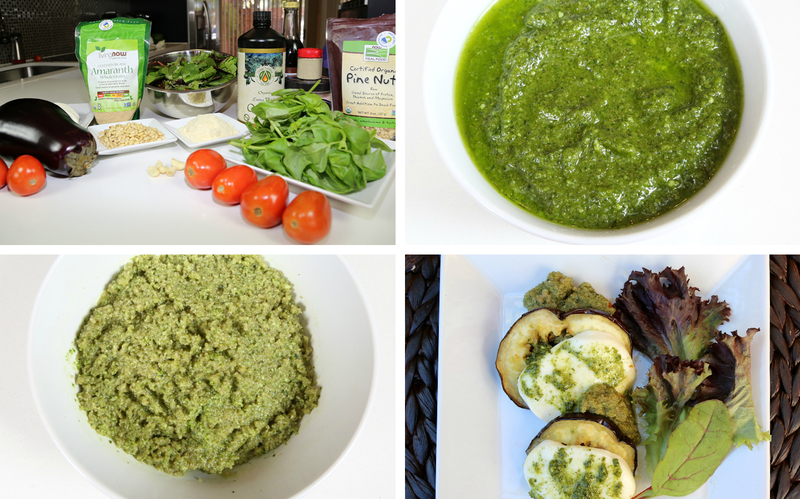 We made our own pesto for this recipe and although it is an extra step, it will be tastier and healthier than store bought and you can use left overs to make an incredible pasta a la pesto! Sounds like a good deal to me, wouldn’t you agree? Add all the ingredients in a potent blender or a food processor. Pulse and blend the ingredients until they are well combined. Boil 1 cup of water and mix in the 1/2 cup of amaranth. Reduce the heat to low, cover pan, and let the grain cook for about 20 minutes or until the water is absorbed. After the grain cools, mix with 1/4 cup of the pesto sauce. Cut the eggplant in 12 slices making sure that the slices are thick (if too thin, the eggplant might get stuck in the bottom of tray), brush both sides of the eggplant slices and place on baking tray covered with foil. Cut lengthwise in half the plum tomatoes and scoop out the seeds with a spoon. Add very little salt (less than a pinch), a couple of drops of balsamic vinegar, and a little olive oil in each tomato and place in different tray from the eggplant. Place both trays in oven for 30 minutes making sure that after 15 minutes, you flip eggplant slices. Replace the foil in the tray used for the eggplant. Add 1 teaspoon (if plum tomatoes are not that big) or 1 tablespoon (if plum tomatoes are big) of the pesto and amaranth mix in each plum tomato half and arrange tomatoes in tray. 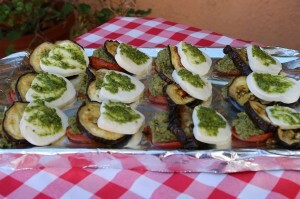 Top the mix with a slice of eggplant followed by a slice of mozzarella and smear a little extra pesto sauces on top.